It had been planned for over a month, the weekend of 7,8 & 9th Sep 2012, the thread on the racekites forum had buzzed for weeks, the facebook meet thread had also been buzzing with excitement…..I was really looking forward to this weekend. My youngest sons 22nd Birthday is on the 7th, so that would mean missing his celebrations, also my Daughter and her fiancee were traveling back to Lincoln for the weekends celebrations, again I would miss them too….but I knew this would be the last Bolton Le Sands meet of the year, from this weekend on the beach would not dry out enough for a decent gathering. As the date grew closer, the weather predictions on all the major sites were not good, the best days wind wise, were the Thursday and Friday, and much lighter winds on the Saturday and Sunday….I was struggling to make a decision as to whether the trip was worth the 370 miles driving or not…what do I do? what do I do? I got home from work at 5.00pm on Thursday, checked the weather sites again and made a decision….I would go tonight, I would pack up and leave within the hour. I set off in the evening sun, thinking this is the right decision, I would get a full days buggying on the Friday, then leave either late Friday or early Saturday to get home to catch the end of the celebrations….the evening drive was pleasant watching the sun go down on the motorway over the Pennines….but that was all to change. No sooner had I reached the M61, it started to rain, I wasn’t too bothered as nearlly every time I make this journey I come into rain over the Pennines, but this time the rain didn’t stop….it was now pitch black and the rain was driving hard against my window screen, this was bad news as the beach needs at least two full dry days to dry out, but it was also a neap tide which should help, but this rain would take some drying up for sure. 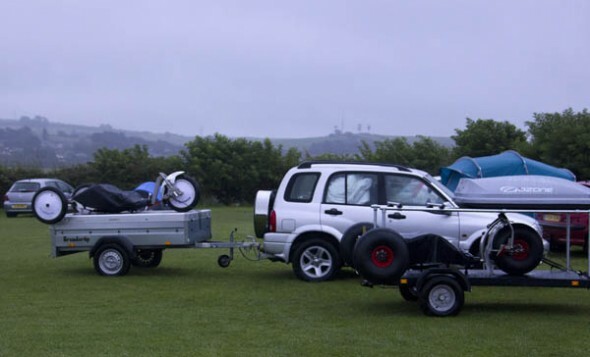 I reached Bolton Le Sands around 10.00pm, I saw Flettie in his little caravan on the BLS car park, so I pulled over. he was on his own and fed up to say the least, he had been there most of the day, and said the heavens opened up around 4.00pm, and strangely also said the tide had almost covered the beach…on a neap tide we should not even be able to see the sea at all….so this meant the beach would be soaked, plus it was still pouring down. I was totally fed up, and wanted to turn around there and then and head home. I phoned Denise, and she persuaded me to stay the night and see what it was like in the morning. So after enjoying a nice coffee with Flettie, I headed up to the camp site and put the tent up in the driving rain in total darkness. The rain kept me awake all night hitting the canvass roof, I knew it would be a wash out, I heard other buggiers arrive through the night, Steve aka UKSpeedtraps, and Mark aka vx_m4rk (620 mile round trip)….I already knew Kristine had been there since 4pm too, so on that Thursday night there were already a few of us there. 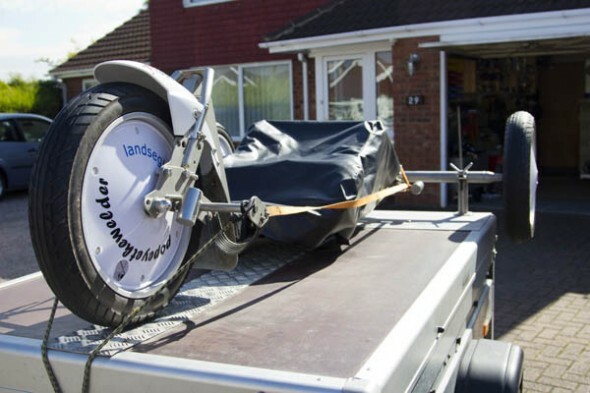 Packed up ready to head home again…. By 7.00 am I had had enough and started to pack the tent away, it was still raining, I looked at the beach for the first time since I had arrived, and it was flooded, I had never seen it so wet before, but to be honest, it was exactly what I expected to see after all the rain. 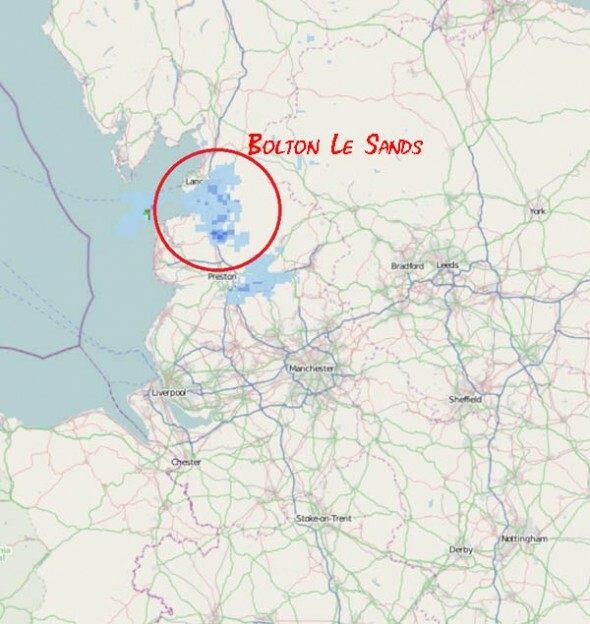 Steve came over as I was sat in the car, we looked at a satellite live image of the area on his Ipad, Bolton Le Sands was under a huge cloud….it was the only place, everywhere else around England had perfect sunshine…. WHY, WHY,why were we so unlucky, Mark and Kristine came over, I felt even more sorry for Mark as he had traveled from Kent, and I knew there were others already heading this way, I had already warned people not to bother coming, but I know it was already too late for many. This entry was posted on Friday, September 7th, 2012 at 12:33 pm. It is filed under Bolton Le Sands, General and tagged with Bolton Le San, Flettie, Kristine, UKSpeed Traps, vx_m4rk. You can follow any responses to this entry through the RSS 2.0 feed.